It’s time to start packing and relax into a long and well-deserved break from it all. Leave enough luggage space for your portable yarn projects, taking a lot of slow time to dream up sunny fiber art pieces. KOEL’s got you covered - whether you’re dozing off on sandy beaches or zipping afternoon cocktails in your favorite watering hole, we’ve made sure that you have the latest modern yarn crafting trends at your fingertips. Reliving our childhood days, we bring you exciting kids’ room projects. Get into a crafty mood with crochet and knitted stuffed animals designed by Pica Pau and Claire Garland. Color landscape wall weaves by Soft Century’s Katherine Entis and embroidered wall art from Adriana Torres of Miga de Pan will transform the look and feel of any kids’ room - great to work on with your little ones during vacation downtime. We fell in love with mint green and pastel pink, and embarked on a passionate journey - redecorate your home for the sunny season with crochet cushions and throws in these daringly sweet colors. Anique van Kooij of Klein Maar Fijn shows us how. Punch needling, tufting and latch hooking are fierce rivals but are one and the same family. For this Issue we chose punch needling and tufting. Why? Because we could work with the best in the industry - meet Rose Pearlman and Loomshakalaka’s Emily Primbs. Making a grand entrance in this Issue, is Maryanne Moodie. Her iconic pieces decorate the new KOEL showroom and will inspire you to think much bigger and better! 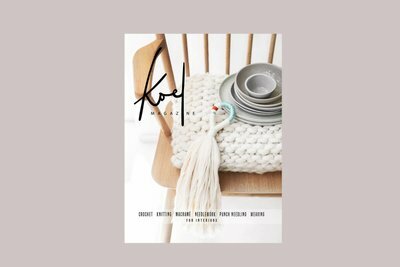 And there are some funky KOEL products that have come online - to name a few: macramé tutorial posters so you can study up on your favorite knots, latch hook kits in summer colors, tools, supplies and hand dyed yarns. Only the best, naturally. There’s more to enjoy still - vintage needlework, Caribbean macramé wall art, lots of inspiring KOEL Stuff finds and many pretty patterns that will spark your creativity.